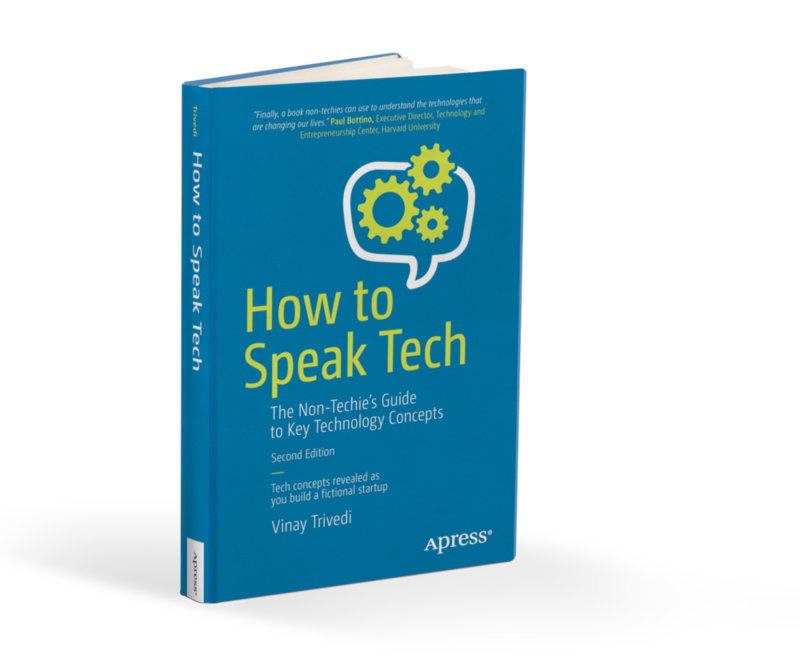 Following the success of the 1st edition, How to Speak Tech is back new and improved! Featured at South by Southwest (SXSW), How to Speak Tech covers the need-to-know technical terms and technologies of the Internet startups and latest tech trends that are redefining society. It is motivated by the mission of democratizing access to and understanding of technology. We are donating a portion of the book’s profits to organizations whose missions align with ours. Things you’ve done online: ordered a pizza, booked a hotel, and reconnected with long-lost friends. Now it’s time to understand how these things work. Vinay Trivedi peels back the mystery of the Internet, explains it all in jargon-free terms, and gives you the knowledge you need to speak confidently when the subject turns to technology. First launched at SXSW in 2014, How to Speak Tech returns to the stage in 2019 with new things to share. How to Speak Tech follows the narrative of a fictional startup building its first product and explains the essential terms and technologies along the way. The book includes primers on several tech trends, including the blockchain, augmented and virtual reality, the Internet of Things, and artificial intelligence. It is apparent that new credentials are required for informed citizenship, economic participation, and social mobility in a society transformed by the Internet and technology. Technology is no longer important only to tech companies; it is shaping and disrupting every industry. It is becoming more and more evident that everyone needs a basic understanding of computer science. Many barriers exist to democratizing access to tech education, none of which have simple solutions, and they have consequences. We have less diversity in STEM, which contributes to worse outcomes and greater inequality. We risk not preparing the next generation adequately for our digital economy. And we may struggle to retrain those displaced by the forces of automation. How to Speak Tech is a book but it represents the full team’s commitment to tackling the broader mission. Only 40% of K-12 schools in the US offer some kind of computer science education. According to a recent McKinsey report, automation and digitization could displace 14% of the global workforce (375 million people). Women only comprise 30% of the STEM workforce despite being 50% of the population. For racial and ethnic minorities, the figures are 11% and 27%, respectively. Vinay Trivedi works in technology investing with experience at Blackstone Private Equity and SoftBank Vision Fund. He angel invests out of an ESG-oriented pre-seed fund that he co-founded called Freeland Group. Trivedi serves on the Steering Committee of Startup in Residence (STiR), a program spun out of the San Francisco Mayor’s Office of Civic Innovation that connects startups with government agencies to develop technology products that address civic challenges. Through the simplicity of his presentation, Vinay shows that the basics of technology can be understood by anyone who puts in the time and effort to learn. There are many ways you can support our efforts and those of our partners. Please reach out with any ideas you may have. We would love to hear from you. Available on Amazon and in select stores in paperback, ebook, and (soon) audiobook formats. Please help us spread the word about our book and our cause. A tweet or post goes a long way. We would love to hear from you about what you are working on and how we can work together.